Outdoor enthusiasts searching for a relaxing fishing or paddling location can find it on the Iroquois River. The rock bottom river winds casually through Jasper and Newton County Indiana into Illinois, a total of 94 miles. 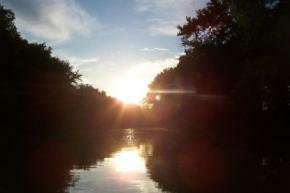 The Iroquois River is home to carp and catfish around the drifts or smallmouth bass and panfish downstream. Now, I am of course biased. While the history books state that many settlers bypassed this smaller river in favor of the larger Kankakee and Tippecanoe, the Iroquois calls to me. Its waters envelop farmland, communities and landscapes with sloping golden green pastures, tiny ag-burbs of familiar faces and reticent towering trees. Growing up in Brook, which hugs the Iroquois River, I saw the body of water every day. Living on a tributary of the Iroquois, on land my family has owned for more than 100 years, my connection runs deep. But it&apos;s my older brother Thad who is the true champion of the river. I like to refer to him as a refined redneck. He&apos;s a world-traveling pilot based out of Chicago with a refined taste in wine and food but is just as likely to be found in a nearly see-through cut off T-shirt, torn khaki shorts and flip-flops in a canoe. 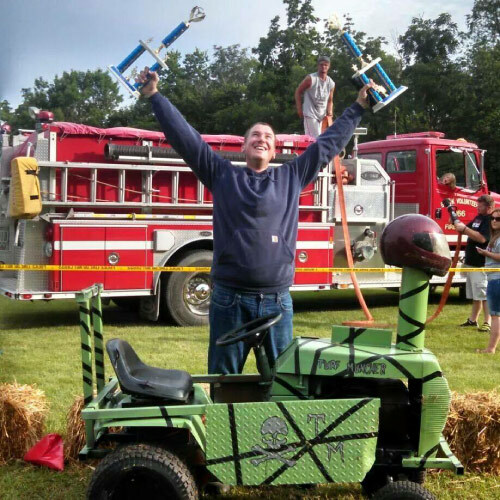 Thad is also, ahem, the Lawnmower Derby King (please see the photo...it describes him perfectly). He loves to go on lazy floats, enjoys fishing in the bayous and spends much of his free time cleaning out logjams with the Friends of the Iroquois River group. While many people pass by the water and may even admire the landscape or the wildlife, Friends of the Iroquois River skillfully navigate the river&apos;s passages. If you would like to experience the tranquil curves and bends of the river then join us for two separate events highlighting the Iroquois. The first event, the Family-Friendly Rensselaer Fun Float is slated for 10 a.m. on Saturday, June 20. The group will be traveling from Laird&apos;s Landing to Bicentennial Park (all in the city of Rensselaer). The float trip will take approximately one hour (depending on how fast you paddle!). Safety guidelines and instructions will be administered at 10 a.m., with a launch time of 10:30. Be sure to stay afterward to learn more about the Upper Iroquois Watershed Initiative and take a tour of the rain garden in Bicentennial Park. Refreshments will be provided by Slice of Pie Pizza in Rensselaer, and don&apos;t forget to grab your coupon for Busy Bee Ice Cream adjacent to the park. The next event is slated for Saturday, Aug. 29 in Brook. This event, in partnership with the Northwest Indiana Paddling Association, will take off from the bridge next to George Ade Memorial Home, two miles east of Brook, and get out at the Newton County Fairgrounds in Kentland. This longer float will wind through tranquil farmland and wooded areas. Participants can expect to see swamp milkweed and swamp rose mallow, oak, hickory, walnut, cottonwood, willow and ash. We will also be on the lookout for squirrels, raccoon, chipmunks, ducks and turtles. More details will be available closer to the event date. The Upper Iroquois Watershed Initiative is dedicated to connecting people for watershed improvement to ensure an ecological and economically healthy Iroquois River watershed for today and generations to come. The events are organized in partnership with Friends of the Iroquois River, the Newton County Park Board, The Iroquois River Conservancy District, the Northwest Indiana Paddling Association, NICHES, Jasper County Soil and Water, and Newton County Soil and Water.